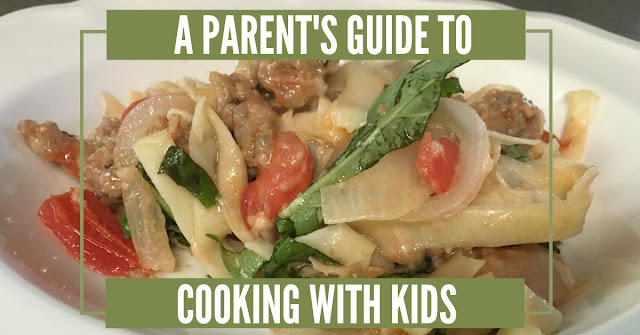 Disclosure: Some of the links in this post, A Parent's Guide to Cooking with Kids, are affiliate links, and I will receive a small commission if you click on one of those links and make a purchase but it comes at no cost to you. When I'm chopping and dicing and mixing and stirring I get an overwhelming sense of pride, not necessarily because what I'm making is so delicious or even noteworthy, but because I know that my work directly affects my family's health, well-being, and nutrition. I know that the care I take when I whip up a coffee cake or roll together a pan of Jumbo Chicken and Onion Enchiladas will benefit my family. I take special care with my meal planning and recipes every time I cook because I'm aware of their impact. I like to share this meaningful experience with my readers, and I do so by sharing many of my recipes, but more than anything, I love to share the experience with my children. My kids are not strangers to the kitchen. In addition to watching my favorite cooking shows, they have also been my little kitchen helpers since they each were big enough to stand. They are accustomed to seeing me bake and cook, they enjoy being taste testers, and they fight over who gets to claim mixing duty each day. I try to include them in the entire cooking process from menu planning and choosing items from the farmers market or the grocery store to preparation before the cooking begins and then kitchen cleanup. My husband and I developed a love for cooking together while we were dating, and we try to now include our children in the experience whenever possible. It's an understatement to say having kids in the kitchen can be challenging. There are the obvious safety precautions that always need to be considered. Additionally, they are unable to do the math for recipe manipulation, so you have to be prepared ahead of time if you plan on doubling or halving anything. Plus, and maybe most challenging, their tiny frames can't see or even reach the top of the countertops. Over the years I've learned a couple of tricks to help make your time in the kitchen with your children fruitful for everyone. I'm sharing some of those hard-won lessons with you. Choose the right recipe and explain everyone's individual role before getting started. Julia Child's book, Mastering the Art of French Cooking is not a good starting point for adults who don't know how to cook, let alone children. Start simple and work your way to more complicated recipes. If you're working with multiple children, it can be beneficial to clearly outline who will manage each duty, so there isn't any confusion once you start cooking. Make it fun. Turn a mundane, everyday task like cooking, into something fun and extraordinary, so your kids look forward to their time in the kitchen. You can do this many ways. For example, one afternoon my oldest son asked to play with play doh, after some quick thinking and an inventory of my cabinets I decided to make homemade noodles instead of playing with play doh. A little flour and eggs and two tiny but messy hands later, we had homemade noodles for our dinner that night and boy were they delicious! My son never missed playing with play doh. Making meatballs, meat loaf, and kneading bread are also fun ways for kids to get their hands messy while being helpers. These dipped peanut butter bananas are also a good introductory recipe. Prepare ahead of time. Some kitchen tasks are just not appropriate for young children. If you can, try to have those things done before having the kids join you in the kitchen. Consider dicing, chopping, and butchering all necessary ingredients before you invite your little ones in to help. Make sure all the ingredients are handy once you get started so that your children are not waiting around as you gather mixing bowls and ingredients. We all know the attention span of kids is much shorter than adults and they need to remain stimulated throughout the process if you want to keep them interested. Keep things interesting. Another way to inspire alertness and participation from children is to keep things interesting. Change up recipes, so your little ones aren't always helping with the same meal over and over. Experiment with flavors and textures. This is easy to implement even at the grocery store. Let your children pick a new fruit, grain, or vegetable and do some research on interesting ways to include it in your families diet. During the summer I let my kids pick new fruits like star fruit or dragon fruit, and when we come home, we sit down and taste it together. Patience is key. I'm preaching to the choir here because having patience is a pretty obvious ingredient to parenting, but one of the things I really struggle with both in and out of the kitchen. Mistakes and messes will happen - remember that you are teaching your children a life skill, take a deep breath and try to fix what you can or improvise to make the most of a bad situation. Have a backup plan. Keep a frozen pizza or some extra lunch meat available in case things don't go according to plan. Children are unpredictable, and you never know when they are going to dump the entire container of black pepper into the White Beans and Ham recipe instead of just a sprinkle. Opps! The right equipment is essential. Certain items are beneficial if you want to be inclusive of little helpers in your kitchen. 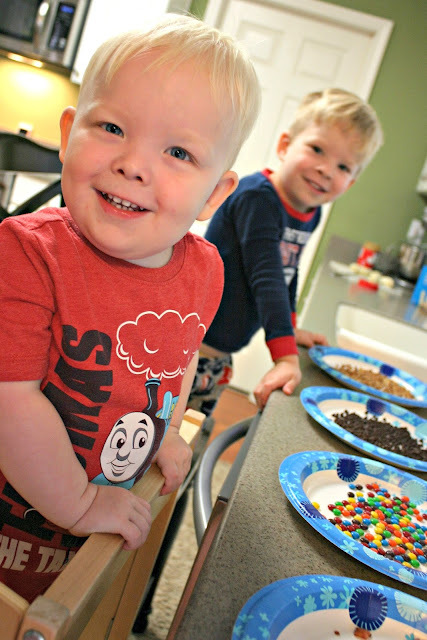 My boys both love to wear aprons and I'm a big proponent of them since they help keep their clothes a little tidier. I like to make sure each one of my kids has their own unique spatula, and I try to use bowls with spouts so that it is easy to pour things from one bowl to the next. A small egg timer is nice to have around because it allows them to get a better understanding of timing and a thermometer is a must to teach them early the healthy internal temperatures of various meats for safe consumption. Of all the tools and gadgets in my kitchen, my absolute favorite thing for cooking with kids is our kitchen caddie. It is a collapsible wooden contraption which the boys stand on so that they can easily reach the counter. Unlike a step stool or a kitchen chair, there are raised sides all the way around so that the kids are less likely to fall. We have the Guidecraft Kitchen Helper, and I swear by it. Now that I've shared some of my secrets for cooking with kids, I'd love to know your favorite kid-friendly recipes. Please share recipe links in the comments below and let me know if you have any tips that I left out. 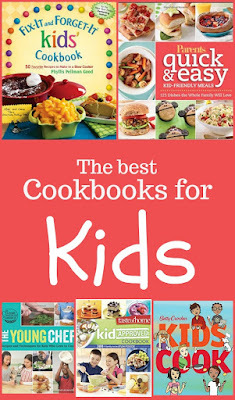 This a great guide for parents who want to get started cooking with their kids. My kids LOVE to help out in the kitchen. It is nice that you have the patience to cook with young children and teach them. My daughter is 16 and just getting started in learning to cook because she wants the healthy food she likes. I have loved having my girls in the kitchen with me as they have been growing up. My oldest wasn't too keen on the idea of it. However she took culinary when she was in high school, so apparently some of that love for cooking rubbed off. My youngest is always eager to be with me, learning, and cooking. Ian is obsessed with helping me or pretending to cook these days, but I find it easiest to bake with him.... hahaha but a healthy diet is not baked goods. I am going to have to look into those books you recommend, because we need to venture out of baking into real cooking. He does like to make rice though and will ask if I'm using chicken stock because of it hehehe teaching him to cook is not my strong suit though, but we're trying! My kids love to help me in the kitchen and while sometimes they drive me crazy because i could get it done 10x faster i know its something they will remember! First and foremost, these photos are so precious! Secondly, thanks for sharing! My little one loves to help me in the kitchen but sometimes I worry that what I'm making isn't safe for him to help with. Going to give this a try! I feel like I'm not going to be cutout for sharing my kitchen with my children because I'm getting impatient just thinking about it! I'll try to keep this in mind when they're old enough. Love cooking with kids! That cookbook looks interesting too! It's fun to get them involved sometimes. Even on food themed nights. Like make your own pizza! The one about having a back-up plan made me laugh. It's such a good idea though. I think it's so important to teach kids age-appropriate cooking skills. I wasn't taught those skills as a kid, and I had to play catch-up later. With five daughters, I've done a fair amount of cooking with kids over the years, and you are right on the money with this list! Always have a back-up plan! When ever I venture into cooking with kids I have to let go of all expectations and control. I need to teach them a bit more though. I am pretty sure I knew more than they do when I was their age. Cooking is a skill that I want all my kids to learn, it's definitely going to help them when they're older especially when they're on their own. I think it's really nice to allow the kids to join you when cooking! This is such a nice guide for that. These are such great tips, Brittany -- and your kids look like they're having a blast! This takes me back to when our four kids were little. I always had them in the kitchen cooking with me and they loved it too. Now they all have mad cooking skills and truly enjoy cooking. These are some really great tips. My kids love to get in the kitchen and cook with me. 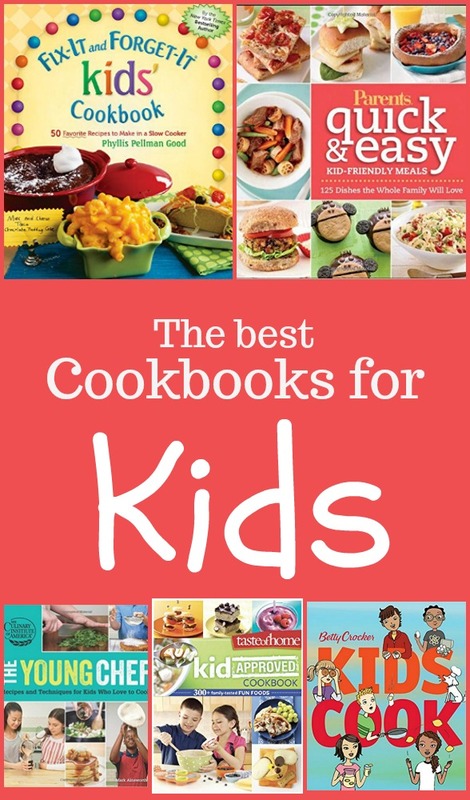 Great tips for cooking with the kids. My daughter loves to be in the kitchen with me. Definitely some great tips here to cooking with kids. I have a little one who love to work with me in the kitchen. I am happy to teach her as these are definitely some life skills she should learn, and learn early to sustain it. Our kids love to eat, but they love to eat even more when they help cook the food! These sound like some great books and links! I truly love this. My favorite memories of my Grandma Holt is cooking with her. We made jelly together and baked all kinds of goodies. I have some fond memories cooking with my mom and gran. Baking cakes, and making mint sauce with mint from grannies garden. Seems like a lifetime ago! Such cute pics! I took a cooking class when I was about 12 and I loved it! Cooking with your kids can be quite messy and hectic but nonetheless fun. Totally agree with the guide, preparing everything before hand and assigning roles for each of them is needed. I love that you encourage your kids to come into the kitchen and cook with you. I agree that it is best to do the more tricky or dangerous things like chopping and dicing. Patience is definitely key! Great book suggestion! I love the extra help I get in the kitchen with my girls. They love to cook with me! My four year old has been telling me he wants to be a chef. I love cooking with him because I can see how excited he is every time!